The story below was recalled by Rwandan refugee Bandele. * The details described are accurate to the best of his recollection. Although he was still a child when the violence broke out, Bandele, a Rwandan refugee who now lives in Kampala, remembers a time his family lived in peace. When war ravaged his home country, Bandele was separated from his parents and siblings. For twenty years, he lived without knowledge of their whereabouts. But a chance introduction to REFUNITE led Bandele down a path to reconnect with his older brother. The two brothers continue the search for their other siblings and parents, hopeful that one day the entire family will be reconnected. “My dad used to like to watch movies and football with the whole family,” remembers Bandele, a survivor of the Rwandan genocide who lost touch with his two brothers, three sisters, and parents during the war. Bandele is sitting in a sparse interview room provide by nonprofit InterAid. At this hub for refugee services in Kampala, Uganda, Bandele recounts his memories of the time he spent with his family before the violence. Twenty years later, the family lineage that Bandele’s father pressed upon his young children became the key to the reconnection of two separated brothers. 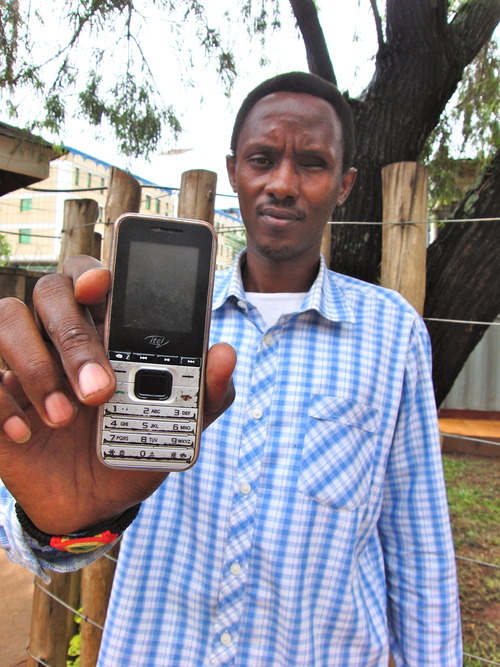 Through REFUNITE assistance, Bandele began the process of reconnection that he hopes will one day lead to all his missing family members. Kampala is home to a mobile operation targeting refugees, run by REFUNITE, UNHCR, InterAid, and the Office of the Prime Minister. It is also home to over 192,000 refugees, many of whom fled violence in Rwanda years ago and have no country or family to which they can return. As a child fleeing genocide alone, Bandele made his way to an orphanage and eventually, after he was adopted, to Uganda with his new family. But when his adoptive family was resettled to the United States, Bandele, who had no biological relation, was left behind. As a refugee in Uganda, Bandele came to InterAid to see if he could receive support in his ongoing job search, and met a REFUNITE Outreach Volunteer, who showed him how to register on the mobile family-tracing platform. After two months, Bandele returned to InterAid to find the volunteer who had helped him register. He asked for assistance in using the mobile search tool. Bandele found a listing for a man with the same first name as his older brother, Abelard* – also a refugee of the Rwanda genocide. Bandele sent him an SMS message asking for his email address. But the man was hesitant. Only after Bandele answered a series of questions regarding the relatives and elders whom the brothers had visited as youths did Abelard finally believe that he had reconnected with the younger brother he lost two decades before. Now, in addition to email exchanges, the two men speak once or twice a week over the phone. Bandele lives in Kampala, while Abelard is in France, where he had been resettled during the conflict in Rwanda. “I never though I would see my real family again,” he admits. When asked about speaking to his brother for the first time, Bandele laughs a little and his face visibly relaxes. From a family of six children, Bandele and Abelard are still the only siblings to reconnect, and neither knows the whereabouts of their parents. He recognizes that the search is not over. *For security reasons, all names have been changed to protect the interviewees. The above interview took place on April 15, 2014 at InterAid in Kampala, Uganda. It was conducted in English by REFUNITE employee Carolyn Nash, with responses translated from French by a REFUNITE and InterAid volunteer.